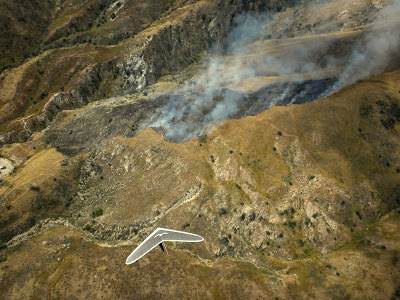 This weekend Sylmar Hang Gliding Association had its annual Spring Air Festival. Expecting Friday traffic around LA, I was pleasantly surprised to make it to the Flight Park in under an hour and half from Santa Barbara. On Friday a few cars headed up to the Kagel launch.Sylmar has an outstanding group of local pilots and has turned out several National Team members such as, Phil Bloom, Ron Weiner, and Chris Smith. Several of the locals were kind enough to show me around, Rob Burgis, Jeff Chipman, Jonathan Deitch, and Phil Bloom took me on a tour to the east. We quickly raced past Lance’s and over to Big Tujunga. A little under 4000’ I led the charge across to little Lukins. This is a little lower than they would normally cross, but there were clouds forming and it had been pretty easy so far. There are LZs in the Big T, but as I dove over a few spines I soon noticed that the landing options had gotten a bit sparse, to say the least. I was slow in noticing the drastic wind direction switch which was causing it to quite turbulent. I tucked tail and ran back downwind toward a school with a football field. I couldn’t see any of the guys I was flying with, and was hoping they were doing better than my situation. I was down to 300agl when I found 100fpm up which quickly improved and got me high enough to cross the wash where I found everyone climbing back up. We started heading back towards home and could see a small fire had started on the side of Lance’s ridge at the top of a gun club. 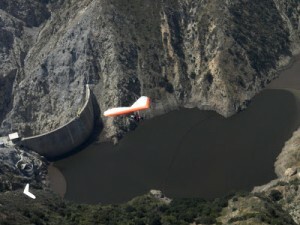 By the time we were crossing over, there were helicopters coming in to drop retardant. We passed through without disturbing their operations and once back to launch headed out to West Towers to complete the introduction. Landing at their club owned LZ is very civilized and inviting. After the flight a group went out for Thai food to complete the day. Phil and Kathy Bloom were kind enough to put me up overnight so we could do it all again Saturday. The next morning, Mike Meier arrived with the trailer full of Wills Wing’s entire lineup of gliders. Joe Greblo, Mike and I were lining up demo flights and briefing pilots on what to expect. In my spare moments Chippy downloaded my waypoints and we put in the competition route. I helped a few people with their Flytec instruments (Make a new route, copy to competition route by pressing McCready, then use McCready again to set the start parameters). Our task was several laps around the local area, with the hope of a high completion percentage. On launch Mike and I helped pilots with pre-flights and adjusting hang heights. Mike pointed out I was about to miss the start, so I launched 12 minutes before the first clock at 2pm. I raced towards start, but figured I wouldn’t have time to get good position. The guys seemed OK with not having perfect position, and taking the first clock, because there were leading points. I drove down course line looking for the next climb and went a bit farther than the rest of the gaggle, at first they were out-climbing me, but then mine turned into 600up and I topped out while they raced under me. From there I took a line under clouds that seemed farther out then they were running and that gave me a big jump getting to the second turn point. From there on I used all the other pilots in the air as markers and didn’t slow up, because I have too much respect for those guys to give them any second chances. After the competition I flew a lovely tandem flight with Alice from Carpentaria. Lynn and Jeff hosted a nice award ceremony and a local artist David fashioned a beautiful glass trophy that I was lucky enough to take home. There was plenty of liquid refreshment, and fun characters to share the rest of the beautiful evening which included a bonfire. Sunday, Mike and I were continuing the demo flights, the thermals weren’t going as high or as strong, but fun none the less. The Sylmar club is a great group that you should definitely visit if you’re in SoCal. I said my goodbyes and headed off to Andy Jackson Airpark where I would fly great tandems on Monday and Tuesday from Crestline.